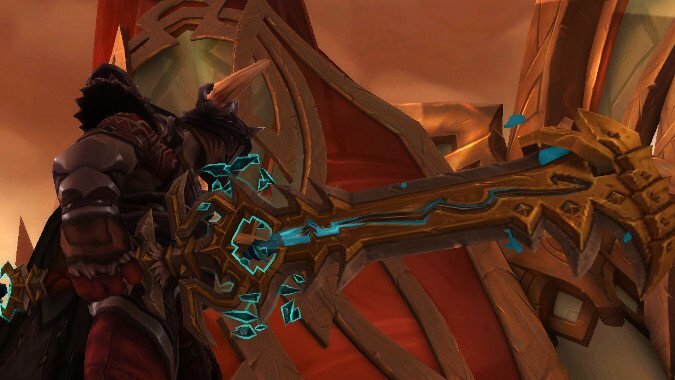 I’d love to thoroughly cover the lore for every Artifact in the game, but it’ll be a long time before I can actually get them all maxed, if ever, so I’m starting with one of my favorites: the Arms Warrior Artifact Strom’kar the Warbreaker. It’s a new weapon to Legion. Unlike some Artifacts, it’s not one we’ve heard of before now. But that doesn’t mean it doesn’t have history. Other swords of legend exist, of course. There’s Thunderfury, Quel’Serrar, Quel’Delar, Felo’Melorn, and of course the Ashbringer. But even amidst this august company Strom’kar is special for being a weapon embroiled in the foundation of Humanity as a nation. Before Strom’kar rested in Thoradin’s hand, there were only scattered tribes of Humans, warring on each other as much as they fought the hostile Amani and Gurubashi Trolls. When Saga of the Valarjar says he changed the destiny of the world it’s not kidding. Before Thoradin Humans were essentially the cast off remnants of the Vrykul, a Titan Forged race that had chosen to isolate itself rather than face the effects of the Curse of Flesh. Native to what would become Northrend following the Sundering, they retreated into enchanted sleep under their cruel, tyrannical King Ymiron. Under Ymiron, those Vrykul who gave birth to ‘stunted’ children (essentially the first Humans) were faced with a grim choice — murder their own offspring or die themselves. Some chose a third option, and set sail for distant lands (many accompanying the Titan Watcher Tyr as he escaped Loken’s takeover of Ulduar) and thus were the antecedents of Humankind. The Vrykul who left Northrend died out. Not able to retreat into an enchanted sleep as did those in Northrend, they saw their descendants (Humans) take their place in the world, as children ever supplant their parents. But they left behind a powerful legacy, gifting their offspring with the secrets of steel, stone and war they would need to develop their own society. Legends of the ancient Vrykul lords were preserved in the items they left behind, in place names such as Tirisfal Glades and Tyr’s Hand. But despite a common origin and common ancestry, Humanity was far from one people. As the Vrykul divided themselves into tribes such as the Dragonflayer, Winterskorn, and Tideskorn so did their descendants. The Humans of the Eastern Kingdoms organized themselves into many such squabbling tribes, and fought each other as much as they did the Trolls who sought to push them out or kill them wholesale. One man, however, saw that this could not be allowed to continue if his people were to survive. Before the Troll Wars, the Amani were an ascendant power. They’d fought the High Elves of Silvermoon for generations (Troll/Elf animosity goes back to before the Sundering, when the Kaldorei carved an empire out of the holdings of the Trolls) and were finally beginning to gain ground on their ancient enemies. 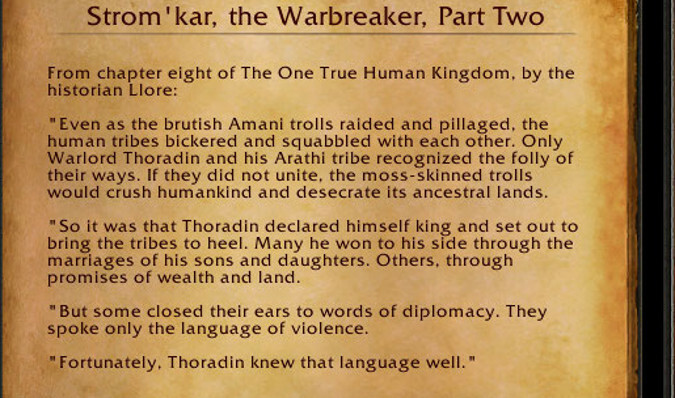 The Amani would not defeat the High Elves easily or soon, but Thoradin saw the writing on the wall. They would defeat them. The long-lived High Elves did not replenish their numbers nearly so quickly as the fecund Trolls, and despite their magnificent magical city and ancient mystical knowledge they would ultimately simply run out of bodies to throw at their enemy. Now, Humans and High Elves barely knew one another. Thoradin’s concern wasn’t for allies: the High Elves barely viewed the Humans as an improvement over the Trolls. No, it was a simple fact. The Trolls hated Humanity for existing in lands they considered theirs, and once they were done fighting the High Elves their raids on Human settlements would turn into full-fledged war. And unlike Humanity, the Amani were a united nation-state that would sweep down from Zul’Aman and push the fragmented Human tribes to the brink of extinction, if not beyond it. Humanity could no longer afford to remain a collection of tribes. If they wanted to survive, Humanity had to unify. And Thoradin set out to do exactly that. What this passage reveals is that Thoradin knew from the beginning that unifying Humanity would be fruitless if he slaughtered the very people he needed. 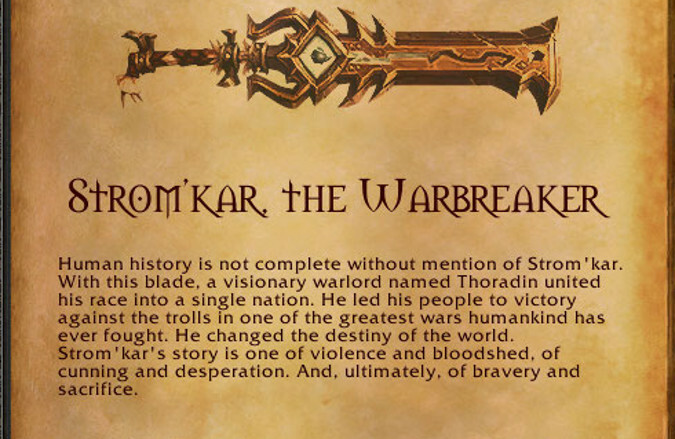 Strom’kar is called the Warbreaker for a reason: it was a huge, terrifying weapon that existed to deal death, an ancient Vrukul weapon handed down from the earliest days of Human history, seized by Thoradin in his merciless march of conquest. But while Thoradin could and did use force, he never did so blindly. 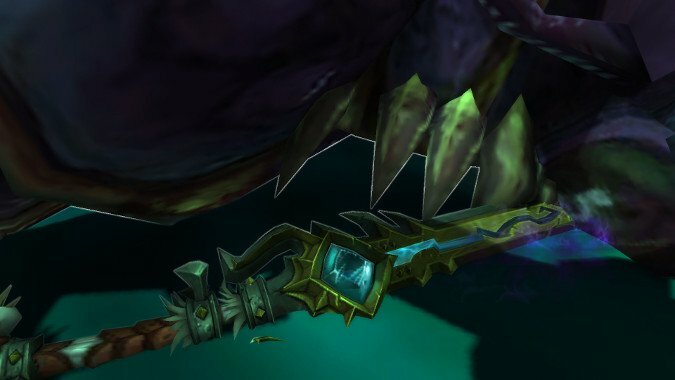 His defeat of Ignaeus (later to be named Trollbane, founder of the Trollbane legacy that would rule in Arathi for generations) showed how Thoradin intended to unite Humanity — he would use the sword when it was necessary, and only when it was necessary. Thoradin united Humankind under the banner of Arathor. His right and left hands were General Lordain of the Tirisfal Glades, who grew up with the legends of Tyr and his sacrifice against a powerful evil, and Ignaeus of the Alteraci. Despite knowing the menace the Trolls posed, Thoradin did not throw his young nation into the gray with them heedlessly. He sent Lordain and Ignaeus to investigate the Trolls and their war with the High Elves, and agreed with Lordain that engaging the Trolls without the ability to counter their dark magics would lead to many deaths and no victory. Eventually, of course, Arathor did enter the war on the side of the Elves, who agreed to teach Humans magical secrets in order to effectively fight against the Trolls. After Lordain sacrificed himself to set up the Amani Trolls for their ultimate defeat, Thoradin found himself a king in peacetime, able to indulge himself and his interest in a certain specific subject — the origins of his people. 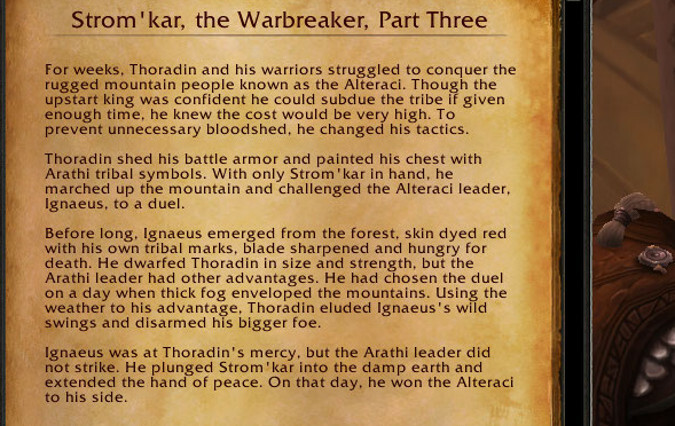 After the Troll Wars, with Lordain dead — the Arathor who settled in Tirisfal named the stronghold they would build in his native land in his honor, and in time the region came known as Lordaeron as well — and Ignaeus serving as warlord, Thoradin allowed himself to pursue his obsessions. The grateful High Elves made a pact with Thoradin that they would come to his aid and the aid of his descendants any time they were asked. (This pact would be fulfilled over two thousand years later when Thoradin’s descendant Anduin Lothar would invoke it during the Second War.) But they did more. 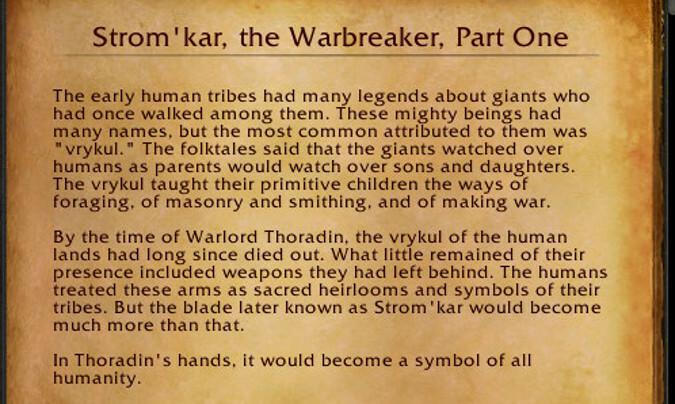 Strom’kar, a product of Vrykul blacksmithing techniques passed down by the ancient Vrykul to their Arathi descendants, would be made even more powerful by the gratitude of the Elves of Quel’Thalas. They empowered the blade, making a weapon that had already won innumerable battles even more deadly. With Strom’kar in hand, Thoradin finally went to the home of his friend Lordain to pursue a legend. For the people of the Arathi had legends that spoke of Tyr, but they knew little of him. Lordain had shared what little he knew with his friend — tales of Tyr as a mighty warlord who died defending his people against an ancient horror — but these did little to convey the truth of the role Tyr’s death played in Humanity’s origins. Thoradin’s research would lead him to a lake and the tomb of Tyr himself, erected after the Watcher died and guarded by those who claimed to have been chosen by the entity himself. (Likely Archadas had a hand in the tomb’s construction, as it resembles ancient sites such as Ulduar and Uldaman.) Despite the protests of the soldiers who accompanied him, Thoradin delved into the tomb and in so doing broke the seals on Zakajz, left nearly destroyed by Tyr’s sacrifice. Horrified, Thoradin watched his men die to the beast. In a final desperate act of courage, emulating his friend Lordain’s tales of sacrifice, Thoradin drove Strom’kar into the beast’s head, a wound that proved fatal to both Zakajz and Thoradin. Thus did Thoradin discover the truth of his people’s origins: they came from an act of sacrifice by one who sought to protect them, an act repeated by Thoradin himself. As for Strom’kar, it endured for many thousands of years until a new champion came to dispatch the monster once and for all and claim the blade, to raise it once more in defense of Azeroth and her people. Strom’kar is a blade that ends wars and defends lives in the doing, safeguarding through might. It is the great symbol of Humanity. And now it may be something more.